This is a set of three floor lamps, inspired by (but not intended to be exact replicas of) the lamps seen in Colonel Elizabeth Lochley’s quarters in The Babylon 5 film “The Lost Tales”. 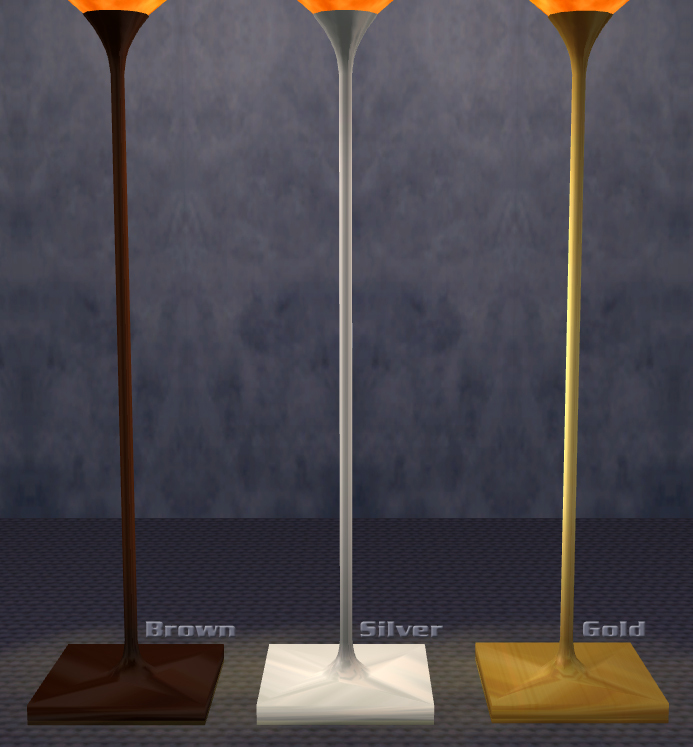 As seen above, the set consists of a short lamp (to the left), a tall lamp (to the right), and also a double lamp for those of you who want the tall and short lamps close together, like the “real” ones, but don’t want to use cheats. This set is repositoried! The double and short lamps are slaved to the tall lamp. This means you must have the tall lamp (obj_nixnivis_lochleylightfloortall-MASTER.package) in game for the other lamps to display properly! This entry was posted on 15 June, 2011 at 08:57	and is filed under Babylon 5, BUY MODE, DOWNLOADS, Lighting, Objects, THEMES. You can follow any responses to this entry through the RSS 2.0 feed. You can leave a response, or trackback from your own site.